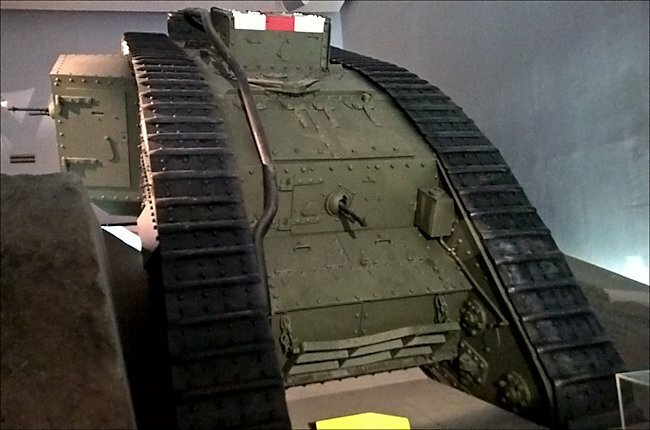 WW1 British Mark V Male Tank at the Imperial War Museum London. 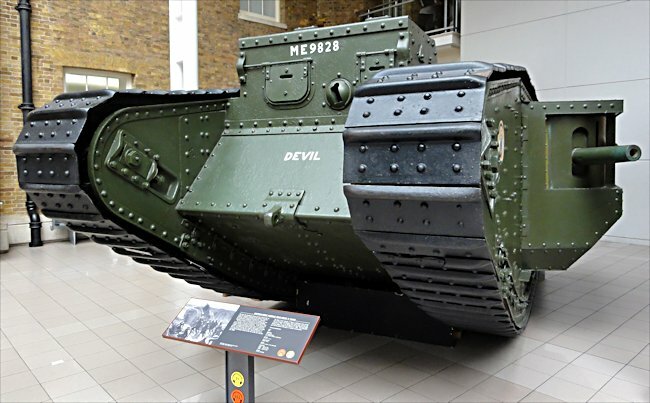 Was the British Mark V WW1 tank really a big improvement? The British Mark V tank first saw action in the last year of World War One at Hamel in July 1918. It played a vital role in the battle of Amiens and the Hundred Day offensive that led to the armistice in November 1918. 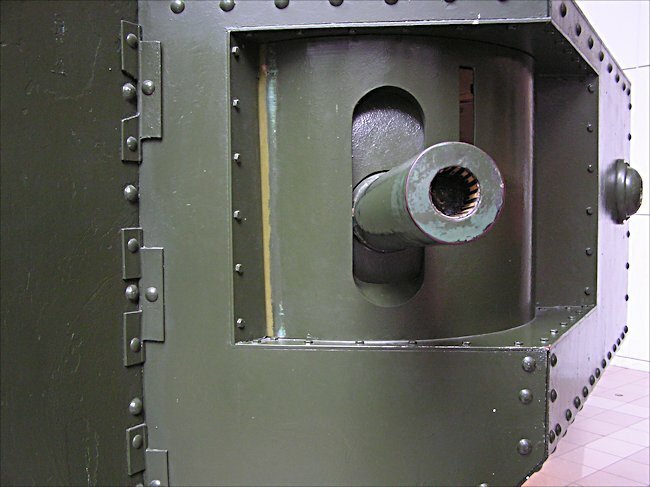 It had been intended that the Mark V tank was going to be a totally new designed tank but because of the pressure of time this was not feasible. 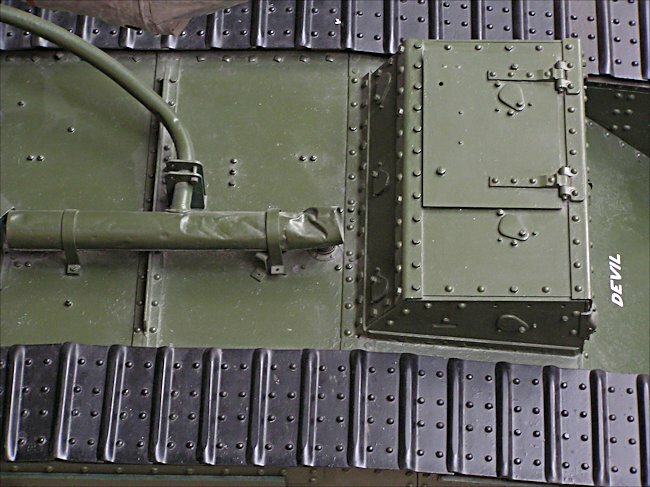 The engineers just improved on the existing features of the tanks that had preceded it. It had a new Ricardo crosshead valve, water-cooled, straight six engine, developed by Harry Ricardo, which produced 150hp rather than the 105hp of the engine fitted in the Mark IV tanks. It could be driven by one man. In the older British tanks the driver needed help from the rest of the crew. This was because a new epicyclic transmission had been fitted. The fume problem had still not been sorted. The tank crews were still fighting for clean air when the tank was on the move. Many of the troopers were physically sick whilst trying to operate the guns or drive the tank. It was not unheard of for tank crew members to collapse from carbon monoxide poisoning. After a tour of duty inside a tank most had bad head aches and sick feeling in their stomachs. 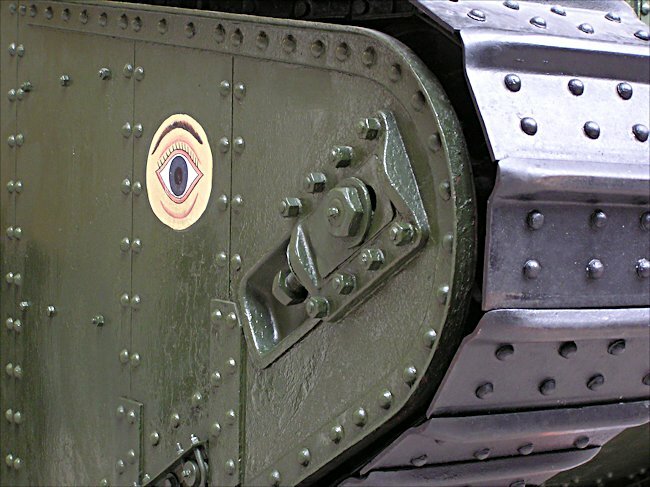 The new Mark V tanks made their name at the battle of Amiens. Over 340 British tanks took part in this mass offensive. Many broke down with mechanical failure. Some where destroyed when they received a direct artillery hit, but they were a decisive factor in making the break through in the German lines. 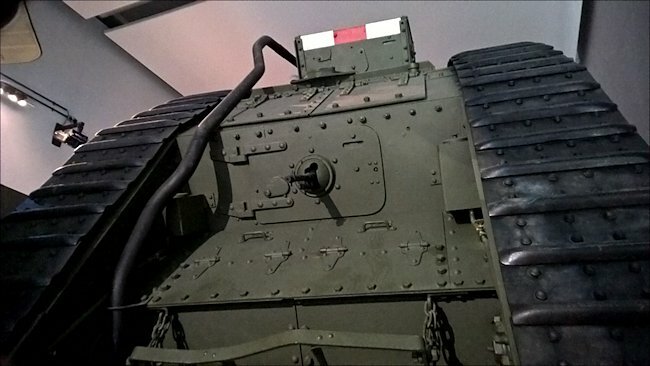 This tank also equipped Armoured units of the French and American Armies towards the end of the war. The mark V tank also saw service with the failed White Russian Allied intervention force that was sent to North Russia to fight the communists. Many ended up in the hands of the Soviets following the end of the Civil war. At the end of WW1 surviving British tanks were sent to various British cities to participate in the victory celebrations. Unfortunately many were cut up for scrap metal as anti-war feelings peaked during the depression and following the loss of so many man. Reminders of what had happened during WW1 were not what the normal members wanted to be reminded of as they went to work. 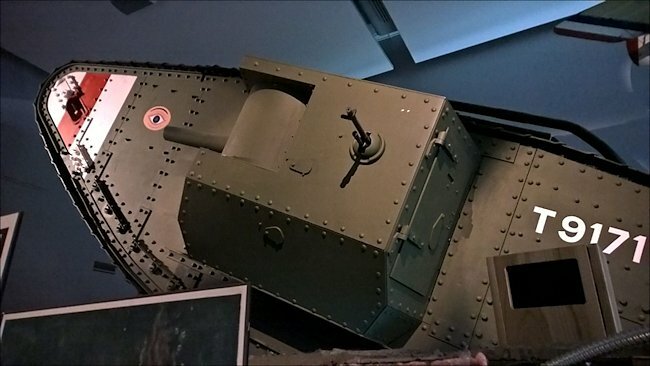 There is one ways of telling the difference between a Mark IV and a Mark V British WW1 tank. Yes they look very similar but the mark V has a very distinctive rear cab which is missing on the Mark IV tank. 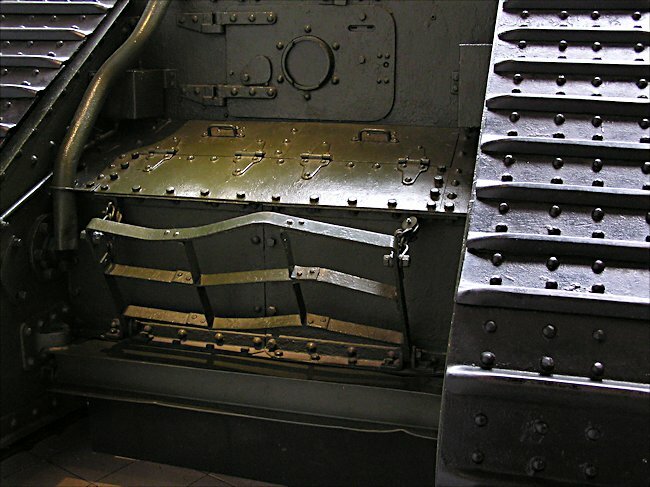 Some Mark V tanks were lengthened to cope with the very wide trenches of the Hindenburg Line. The American 301st Tank Battalion had some of these longer tanks. The Imperial War Museum in London had a major redesign. Most of their tanks were moved to IWM Duxford or put in storage. 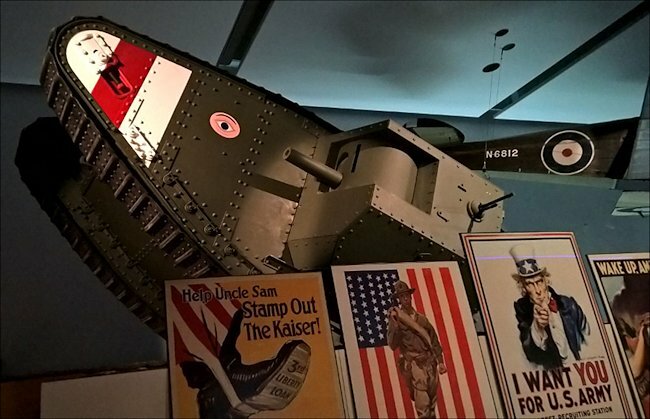 There are now only three tanks left at the IWM London: a Soviet T-34/85 medium Tank; a M4A4 Sherman tank and this MkV British WW1 tank. They have moved it into the middle of a new exhibition on World War One to coincide with the 100 year anniversary of the start of WW1. It has been positioned to appear that it is climbing out of a trench.